Carl Joseph Brezina, 97 years strong entered into eternal peace April 24, 2017. Born in Cleveland, Ohio on March 23, 1920. He met and married the love of his life. Greta (Gizello) Nyiri, before enlisting in the Army in 1942. In the Army Corp. of Engineers he was stationed in Canada, Alaska, the Philippines and Australia. Always ready to fix broken things sometimes successfully, sometimes not so, but he always gave it his best shot, and his whole heart. He was a lifelong fan of the Indians and Browns thru thick and thin. Dad loved western movies and television series, and any good story that was well told. He is survived by his sons Carl (Mary), Bruce and Ron, grandson Christopher, and many loving nieces and nephews. 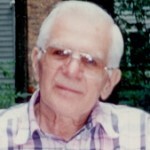 Preceding him in death his loving wife Greta (Nyiri) Brezina in 2009. Father John Brezina, mother Ethel (Valo) and step-father Alex Horvath. brother Andor, sisters Rose Toth, Ethel Schmieg, and Helen Wilk, grandson Michael Brezina, and granddaughter Debra Lynn Brezina-Rowley. Dad and Mom were members of the Greatest Generation. We applaud them, thank them and love them forever.